Sweet little pool for wandering fae. 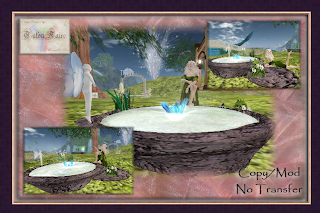 The pool features flitting butterflies, a singing bird, assorted plantings including original cattail sculpts, a tiny fairy statuette, soft vapor, glowing crystals, floating lilies and a custom animation! You really need to see this to appreciate the level of detail.